Fields are automatically populated based on your existing data model with special treatment for date/time, auto-complete and even file upload. Loading data from database and storing it back. Any persistence (SQL, NoSQL) supported by ATK Data (http://agile-data.readthedocs.io/en/develop/persistence.html) can be used. So if looking for a PHP Form class, ATK Form has the most complete implementation which does not require to fall-back into HTML / JS, perform any data conversion, load / store data and implement any advanced interactions such as file uploads. Although Form extends the View class, fields are not added into Form directly but rather use a View layout for it in order to create their html element. In other words, layout attached to the form is responsible of rendering html for fields. When Form is first initialized, it will provide and set a default Generic layout within the form. Then using Form::addField() will rely on that layout to add field View to it and render it properly. You may also supply your own layout when creating your form. Form layout may contain sub layouts. Each sub layout being just another layout view, it is possible to nest them, by adding other sub layout to them. This allows for great flexibility on how to place your fields within Form. Each sub layout may also contain specific section layout like Accordion, Columns or Tabs. More on Form layout and sub layout below. 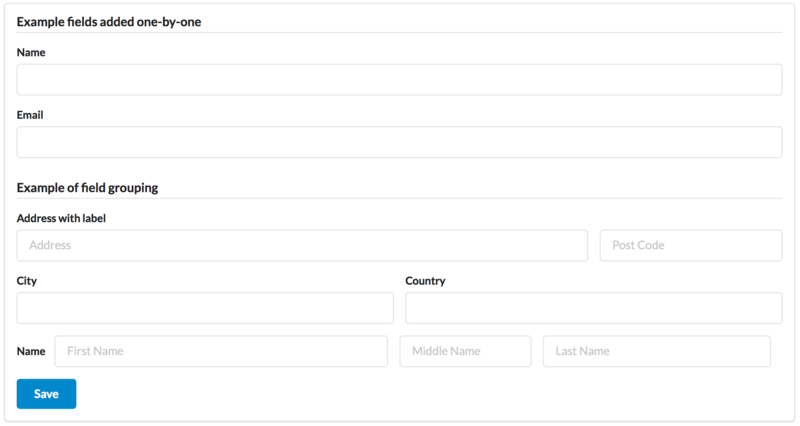 Form uses a small UI components to visualize HTML input fields associated with the respective Model Field. We call this object “Field Decorator”. All field decorators extend from class FormField::Generic. Field date2 has no data type, do not confuse with ui type=>date pass as second argument for Calendar field, and therefore Persistence typecasting will not modify it’s value and it’s stored inside model as a string. In a large projects, you most likely will not be setting individual fields for each Form, instead you would simply use setModel() to populate all defined fields inside a model. Form does have a pretty good guess about Decorator based on their data field type, but what if you want to use a custom decorator? Without the data ‘type’ property, now the calendar selection will be stored as text. Associate fields with existing model object and import all editable fields in the order in which they were defined inside model’s init() method. Specifying “false” or empty array as a second argument will import no fields, so you can then use Form::addField to import fields individually. Note that Form::setModel also delegate adding field to the form layout by using Form->layout->setModel() internally. When using setModel() on a sub layout to add fields per sub layout instead of entire layout, make sure you pass false as second argument when setting the model on the Form itself, like above. Otherwise all model fields will be automatically added in Forms main layout and you will not be able to add them again in sub-layouts. Add additional parameters to Semantic UI .api function which does the AJAX submission of the form. As stated above, when you create a Form object and start adding fields through either addField() or setModel(), they will appear one under each-other. This arrangement of fields as well as display of labels and structure around the fields themselves is not done by a form, but another object - “Form Layout”. This object is responsible for the field flow, presence of labels etc. Fields can be organized in groups, using method addGroup() or as sub section using addSubLayout() method. Group will create a sub layout for you where fields added to the group will be placed side by side in one line and where you can setup specific width for each field. There are four specific sub layout views that you can add to your existing form layout: Generic, Accordion, Tabs and Columns. Generic sub layout is simply another layout view added to your existing form layout view. You add fields the same way as you would do for FormLayoutGeneric. Sub layout section like Accordion, Tabs or Columns will create layout specific section where you can organize fields in either accordion, tabs or columns. In the example above, we first add a Generic sub layout to the existing layout of the form where one field, name, is added to this sub layout. mandatory = value of the field must not be null. Form changes things slightly, because it does not allow user to enter NULL values. For example - string (or unspecified type) fields will contain empty string if are not entered (“”). Form will never set NULL value for them. When working with other types such as numeric values and dates - empty string is not a valid number (or date) and therefore will be converted to NULL. So in most cases you’d want “required=true” flag set on your ATK Data fields. For numeric field, if zero must be a permitted entry, use “mandatory=true” instead. So far we had to present form with a set of fields while initializing. Sometimes you would want to hide/display fields while user enters the data. The only catch here is that “empty” means “not empty”. ATK UI relies on rules defined by SemanticUI https://semantic-ui.com/behaviors/form.html, so you can use any of the conditions there. // Show email and gender when subscribe is checked. // Show m_gift when gender is exactly equal to 'male' and subscribe is checked. // Show f_gift when gender is exactly equal to 'female' and subscribe is checked. //To hide-show group simply select a field in that group. // Show group where 'php' belong when dev is checked. // Show group where 'language' belong when dev is checked.